~ Finally! A treat for the mane at Salon Vim! ~ All about Sally Hansen! ~ Vainpot Private Sale & VGY C96 sneakies! Monday, August 27, 2012 :: Pre-Bali Update! As you are reading this entry on a lazy Monday morning in your office (goddamn! ), I am soaring above the clouds heading to Bali to spend a good 5 days with some other bloggers. Well, I really deserve this getaway haha. I have been working wayyy too hard the entire week for VGY's 100th Collection. Don't get me the wrong way. I enjoy working hard for VGY, to push out beautiful collections every launch. But this time round, I had a nervous breakdown after working nonstop and going on without sleep for 40 hours. I think going on without sleep really had me up in my head. I was on the verge of tears every damn minute! 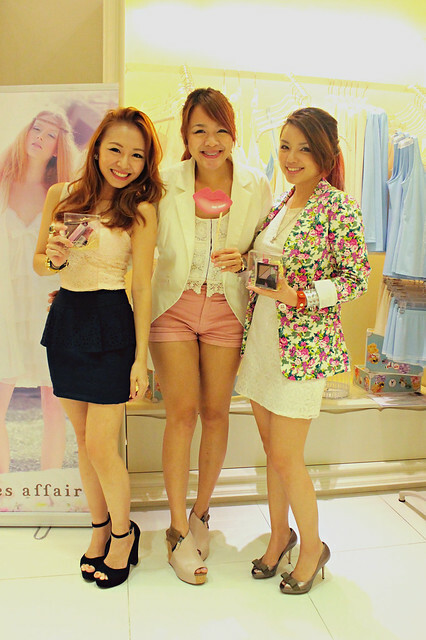 Wore the white one for Maybelline x Zouk x VGY event! And the dark navy one for an event I attended 2 weeks ago! *Will be blogging about this event! 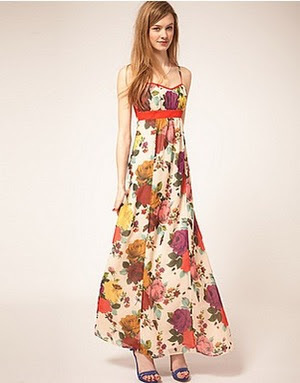 Of the Ted Baker inspired floral maxi, I saw this piece at Taka when I was in the shop to purchase their clutch. Really wanted to get it badly but the price is...close to $300! So I decided to get it manufactured and I made a few tweaks to the design so it is even more flattering than the Ted Baker's piece I tried in the shop! This is the original piece. Ted Baker is a hugeeee company so I believe they purchased alllll the fabric available in the market for this floral design. That's why you don't see it anywhere else. So you are actually paying $300 for this unique floral fabric design. Anyway, the 2 floral fabrics which I chose for this dress have not been used anywhere else (at this moment) and I doubt there will ever be! At least, not anytime soon! Out of the 2 colors, I prefer the Coral piece! The color is even prettier IRL and the sales at KissJane evidently tells me...most customers who see it IRL will buy the Coral one over the Lavender piece. Back to my Bali trip! Visited their website here and the top 10 destinations caught my attention! The first one is Bali and prices start from $213 which is pretty affordable! KLM has 1 daily flight from Singapore to Bali daily. I really like that KLM has a mobile app which allows us to do everything from checking available flights, planning and booking air tickets effortlessly online. It is just like how easy I buy my movie tickets via my iCathay app on the phone to book movies on the go. Eliminates the queue, waiting time, travelling down etc. If you are interested, here is the link to their app! So I will be back with tons of photos and I will do quick updates via my instagram! All your kind words mean so much to me! You girls are absolutely wonderful people! To many more kind and loving people out there, we all make this world an amazing place to live in.